SUBHEAD: From Skripal to Syria – The empire’s “New Realities” are reaching the end of the road. 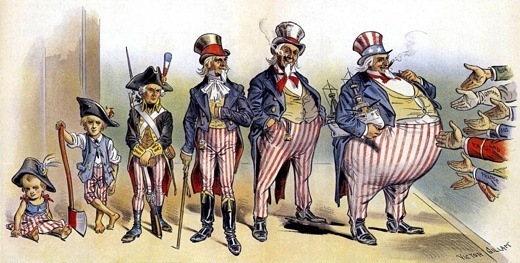 Image above: A detail of 19th century cartoon by Victor Gillam of America's Uncle Sam with the caption "A Lesson For Anti-Expansionists showing how Uncle Sam has been an expansionist first, last and all the time." From (https://fabiusmaximus.com/2018/01/12/an-anthropologist-explains-the-american-empire/). I do wish people would study Rove’s words more carefully. Judiciously study them. If they did, then whenever the next alleged atrocity occurs and the United States, together with its coalition of supine vassals, starts yelling and hollering 10 minutes later for action to be taken, on the basis of a test-tube full of washing powder, or pictures of injured women and children in a war zone, and the entire media of dutiful stenographers shrieks that “something must be done”, then perhaps we might pause and wonder if we are being played. Instead of falling into an emotional spasm, maybe we would instead reject the deafening drumbeats of war – wars that have a habit of killing immeasurably more women and children than the alleged incidents on which they are based, by the way — and ask ourselves whether “Rove’s Law” has come into play. In other words – we are God – and not a kind and merciful God, but a God who lords it over all peoples’, nations and tongues, who tells lies, and then tells more lies to cover up those lies and – when you poor saps are trying to work out what it is we’re really up to. Before you know what has happened, those lies and those lies to cover up lies will have become the new reality. We’ll have moved on and the world with it, and the narrative we have created will have been written in the history books, which we ourselves shall write. I do not know who poisoned Sergei Skripal or for what reason. It could be that the Russian Government was behind it, although this would mean accepting the highly improbable thesis that they decided to target a has-been MI6 spy, who they released from prison eight years ago, using perhaps the dumbest assassination method in the history of the world. It was an ineffective, slow-operating, “military-grade” nerve agent, which could be traced back to them, and which they smeared on a door handle in rainy Salisbury –, a week or so before a Presidential election, and less than 100 days before they are due to host the World Cup. In other words, the official narrative does not rest on accepting that the Russian state is the epitome of pure evil; it rests on accepting that it is the epitome of insanity and bumbling incompetence. I do not know what happened in Eastern Ghouta. It could be that the Syrian Government was behind what is alleged to have happened (if it indeed did happen), but this would mean having to accept the thesis that just 24 hours away from completely liberating the last pocket of resistance in Damascus, after the US, the UK and France had all warned that they would attack if chemical weapons were used, just a week or so after the US President, Donald J. Swamp, announced that the US would be pulling out of Syria (which they occupied illegally, by the way), they made the decision to use a weapon that gave them no military advantage whatsoever, but which was practically guaranteed to be used as a pretext for airstrikes against them. In other words, like the Skripal case, the theory does not stand on accepting that the Syrian state is the epitome of pure evil; it stands on accepting that it is the epitome of self-defeating stupidity on an epic scale. But you see what I’ve done? I’ve fallen right into Karl Rove’s trap, haven’t I? I’m asking questions about whether the narratives in these cases stack up. In the Skripal case, I’ve been judiciously studying reality by asking lots of questions that ought to have occurred to anyone with a keen interest in arriving at the truth (here and here, for instance). I could do the same with the Syrian case, if I had the time. Yet while I’m doing so, the narrative is moving on. I’m falling into exactly the trap that Karl and his disciples have laid. They want two sorts of people: those who just blindly accept that it was the Russians that did it, or that it was Assad that did it; and those who spend their time asking questions about the official explanations. The first group call the second group conspiracy theorists and nutters. The second group call the first group dumb sheeple. And the Globalist Deep State laughs and laughs and laughs as the two groups battle it out to make sense of what has happened, leaving it free to march on to create the next reality. Truly I tell you, these Bolsheviks have learned their Hegelian Dialectics well. Now, this is not to rule out that in the Salisbury and Eastern Ghouta cases the official narratives might – just might – be the correct ones. That both Vladimir Putin and Bashar Assad might be the Laurel and Hardy of Geopolitics. Yet it has to be said that whatever else you think about them, neither of them tends to come across in interviews as being what you might call dumb or inept. Nor do either of them give the impression that they have sudden insane impulses to do things which have absolutely no benefit to them, but which hand their enemies massive PR victories. The point is not whether these particular incidents are what the official narrative says they are, or whether they are provocations. It suffices for the “new reality creators” to create their realities on occasion, or perhaps to distort occurrences which they didn’t create, and before you know it you have your two groups battling over events which may be real or fake. On one hand are the conspiracists – who are studying every event to try to work out the details and the inconsistencies – and the other are the sheeple – who believe that their Government is full of good hearted, white hatted chaps and lasses who would never, ever do anything bad – unlike those orcs over in Mordor. But let’s not get gloomy. The good news is that although they clearly think they can get away with it indefinitely, they can’t. No kingdom or empire built on a mountain of lies can stand indefinitely. They all fall. And can’t you start to sense the signs that the empire’s “new realities” – or what are known as lies in laymen’s terms – are reaching boiling point? Don’t you sense that they have just got too confident and in doing so have begun to get careless? They are making mistakes. And as they do, they are having to resort to bigger and bigger lies to cover up the ones they’ve already told. Sadly for Rove and Co, but happily for the rest of us, the world doesn’t actually work the way they think it does. Reality — I mean real reality, rather than the phony reality they have created — will catch up sooner or later. I sense that it’s on its way even now. And when it finally comes, the whole rotten edifice that these “history’s actors” have tried to create will crash and burn. Bringing much rejoicing.